I was asked to set-up some guest wireless access on a low budget and after looking and pricing up various solutions I decided that the Draytek 2830 fit the bill, in fact I’d been hearing nothing but good things about the 2820 and 2830 range for a little while now so was keen to have a play. Out of the box things were fairly straight forward, I managed to get a basic config down and everything was going well… that was until I power cycled the router. The ACT, USB, CSM and DSL would light up for 20 seconds or so, then they’d all flash off for a second or two and this cycle would repeat itself. Neither the WLAN or LAN came up, so I dug into the sparse troubleshooting section of the manual. If you turn the router on whilst pressing in the factory reset button it should reset to the default config whilst the ACT, USB and CSM lights flash, unfortunately this wasn’t the case for me. The LAN port came up and I could ping the router, but wasn’t able to access the webgui/ssh and after 30 seconds or so the router would reboot and get stuck in the same cycle. Whilst in this ‘mode’ (flashing reset lights), you can also tftp a new firmware to the device which thankfully resolved the issue. Download the Firmware Upgrade Utility and latest firmware from here, there will be two versions. The .ALL is the firmware only and should maintain the config, and .RST includes the firmware and a clean config. Hold the Factory Reset button in whilst turning the router on, the ACT, USB and CMS lights will flash. 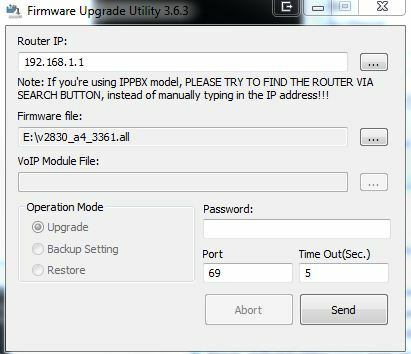 Load up the Firmware Upgrade Utility, enter 192.168.1.1 as the router IP, and select either the .RST or .ALL file. I tried the .RST at first and it seemed to complete the process, but didn’t resolve the issue so ended up using the .ALL. If the attempt times out, make sure you have no other active connections on the machine and/or bump up the time out accordingly (I ended up bumping it to 10 seconds). I did not have to enter a password. After the firmware has transferred across and the router has restarted you should be able to access from http://192.168.1.1 with the standard username and password of admin/admin. You can export the configuration file by going to System maintenance -> Configuration Backup -> Backup- so if you’re reading this and have a 2820/2830 I’d recommend going ahead and taking a backup. I’ll finish the configuration off tomorrow and write up anything else I find, bar this initial hiccup I’ve been pretty impressed. Have you tried bumping up the Time Out(Sec.) setting? One of our 2830s just got itself into a reboot loop – and this article saved it’s life! Thank you so much for posting this. Thank you so much this really work, I could save my vigor 2830vn plus and now it’s work fine. thanks very much for putting up this documentation, it was very helpful in reviving one of our 2820 routers. cheers! My 2830n-plus broke just yesterday (reset loop). Thanks to you, I was able to bring it back to life – thank you! I have the issue that my router 2830 just flashes and NO lan detection after trying all those issues above that all are posting. Does anyone have another way that I can upload the firmware since I have NO lan detection? I CANNOT ping the router. Hey, thanks for this hint. You made my day! change the time to 10 sec is work!! !